In the first half of 2016, Hyundai Motor Manufacturing Rus exported 2,500 cars, including 1,400 to the Middle East. 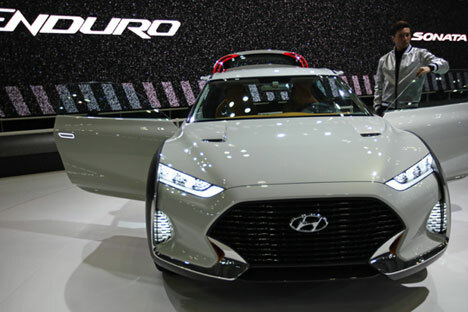 Korean carmaker Hyundai will start to export its cars that were assembled in Russia to Tunisia and Georgia, Industry and Trade Ministry reported on Tuesday. Hyundai assembles cars in Russia at its production site in St. Petersburg - Hyundai Motor Manufacturing Rus. Currently, the plant produces Hyundai Solaris, Accent, Creta, Equus and Kia Rio models. The plant’s production capacity is 200,000 cars a year. "This year, at the end of August, the Russian plant of Hyundai Motor Company expands its export geography and starts supplies to new markets - Georgia and Tunisia. Hyundai Solaris cars will appear in Tunisia and Hyundai Accent and Hyundai Creta - in Georgia," the ministry said. The plant began to assemble Creta model in August this year, and already at the end of this month it will start exports of Hyundai Creta cars to neighboring countries: Kazakhstan, Belarus, Ukraine and Georgia. "In the future, Creta cars will be shipped to the Middle East, but first they will need to undergo adjustment and certification. Hyundai Solaris cars supplied to in Egypt, Lebanon and Tunisia, were specially adapted to the hot climate of those countries," the ministry added. The Russian plant of Hyundai Motor has exported cars to neighboring countries since May 2011, and to the Middle East - since August 2015. Currently, the company delivers cars to Kazakhstan, Belarus, Ukraine, Azerbaijan, Moldova, Armenia, Kyrgyzstan, Egypt and Lebanon. The Industry and Trade Ministry intends to grant subsidies to national automakers for export development, in particular, to compensate 100% of the costs on adaptation of the product to the requirements of a foreign customer and partially compensate transportation costs.